December 26, 2013 Adri H.
Anyway, Laren Mitts pattern is now available in the Spring 2014 issue of Knitscene! They make a great stash buster and gift since they knit up so quickly! -Sizes 6¾ (7¼, 8)" palm circumference; shown in size 7¼"
December 23, 2013 Adri H.
Last week after Ambah O' Brien's interview we held a giveaway for one her patterns, and we have a winner! Sonya, entry #8, was chosen as the winner! Sonya, you should hear from Ambah in the next week or so, please contact me if you have any questions! Have a great holiday season, everyone! December 19, 2013 Adri H.
As part of Ravelry's Indie Design Gift-Along, I'm interviewing two knitwear designers. In the first interview we met Sarah Jordan (PAKnitWit). In today's interview we meet Ambah, ambahobrien on Ravelry. Hello, Ambah! Welcome to my blog. Just in case people don't know who you are... Who are you? Where are you? Hello I'm Ambah, and I design under my own name. I am an Australian and live in regional Victoria - about an hour away from Melbourne, in a vibrant artistic community. Sounds lovely to live in an artistic community. How did you come to design hand-knits? I am an artist and always making, knitting has certainly captured my imagination and it makes sense for me to make designs based on my ideas. Initially I made some patterns for fun, to try out ideas, encouraged by a positive response I find myself completely addicted to manifesting my ideas into designs! I love your aesthetic, Ambah! What inspires your designs? I am inspired by everything. A need for an item, for example I wanted to knit my son a hooded jacket. Sometimes a yarn gives rise to an idea - I designed my Dreamy Valentine shawl after inspiration from the beautiful Valentine colorway in some Dream in Color yarn I had. Other times I am inspired by fashion, art, nature - life in general really; ideas pop into my head and I go to sleep dreaming about how to make it. Do you find yourself working often in a specific style? Not really, I love variety. Though as a new designer perhaps a style will emerge. What is your favorite part of designing? I do enjoy the whole process...apart from when I am tearing my hear out over something! Its so exciting when I realize my idea is working. How can I choose, I really find something to admire in everyone. I am fond of Kaffe Fassett's amazing work, I love the creativity and energy of Stephen West, I admire Veera Välimäki's beautiful designs. Gosh that is just a few names when I could easily mention a 100 more! What do you see yourself doing/exploring in 2014? 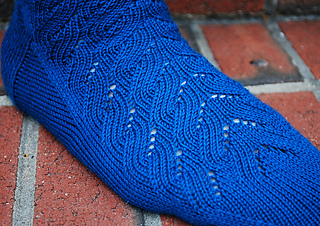 I have more color work ideas, as well as being inspired by texture - particularly lace designs. I have a cute child's sweater I am mid process with that I am looking forward to finishing and perhaps some ladies cardigans - a personal favourite garment of mine. I can't wait to see what you come up with in 2014! Thank you for stopping by, Ambah! If you'd like to see the Ambah's latest work, check out her website: ambah.co. And, readers, as a thank you from Ambah, she's giving away one of her patterns which you can see here. So the winner of this giveaway will receive the pattern of their choice from Ambah's collection, but even if you don't win, check out her free patterns: Tassel Necklace and Easy Knitted Bangle. They'd make a lovely holiday gift! To enter the giveaway, use the Rafflecopter Widget below and click to enter. Simple as that! The giveaway ends on Monday. December 16, 2013 Adri H.
At last, I finished the machine-knitted blanket for the baby boy fraternal twin. The longest part was the finishing... Crocheting a border on the quilt was quite a feat using a 2.75mm crochet hook! Instead of hand-grafting all the long strips together, I found a method that worked quite well... I zig-zag stitched them together using my sewing machine. A zig went into one strip, and the zag went into the other. This kept the edges bound together and sealed in the woven ends. The crochet border was added as a nice finishing touch, but also helps keep the edges from rolling inward as machine knitted items tend to do. I'm already onto the twin baby girl's blanket, and I'll post photos as soon as it's complete! December 12, 2013 Adri H.
Today I'm doing something a little different. 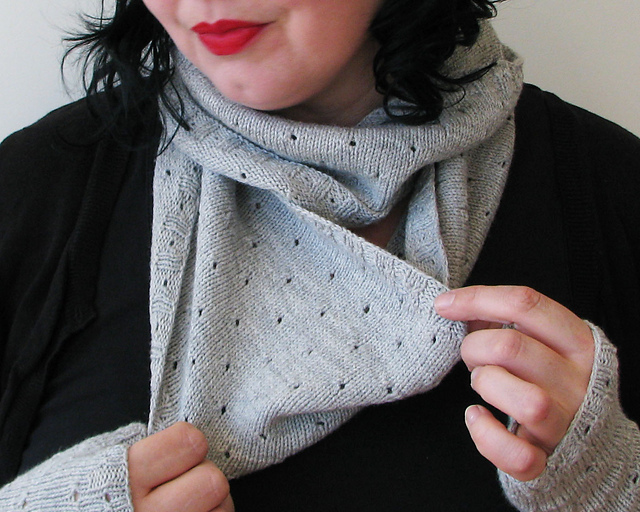 As part of Ravelry's Indie Design Gift-Along, I'm interviewing two knitwear designers. In this first interview, we get to meet Sarah Jordan also known as PAKnitWit on Ravelry! Hi Sarah, and welcome to my blog! I'm a very curious person, and love to know how others came to this profession... So, I'll start with an easy one. How did you come to design hand-knits? I am, admittedly, an obsessed knitter. I learned to knit when I was about 7 years old and was spending a week with my aunt and uncle in Michigan. My aunt had knit for me since I was a baby, and I suppose I expressed enough interest in learning during that week that she put some straight needles and some squeaky orange acrylic in my hands and showed me the basics. I didn't knit much other than simple scarves and the occasional hat until I was in grad school in Philadelphia and lived about a block from Rosie's Yarn Cellar. I was in a pretty intensive grad program, so I started doing a lot of knitting to relieve the stress. I taught myself a lot from the Internet at that point. After I moved back home and started work, I continued to knit during my evenings and weekends, and that's really when I got good and obsessed, particularly with sock knitting (I'm a self-proclaimed recovering sock addict). During the day, I'm an editor/proofreader for a marketing department, which doesn't have a lot of space for creativity, so I still see knitting as my creative outlet. I also started spinning about six years ago, which has only added to my yarn stash. I started designing because I got an idea of something I wanted to knit but couldn't find an existing pattern for it. I found that I liked the process so much that I couldn't stop. Most of my designs come about the same way -- I'll get a very specific vision of a item I want to make but am unable to find a pattern out there that looks exactly like the picture in my head. I still wish I had more time to do it (in addition to my full-time job, I have a young daughter, so my time is really limited), but for now, it's something I do to keep my brain working during evenings and weekends. And it looks like you've been keeping very busy! Inspiration seems to come from everywhere. Sometimes it's from machine-made items that I see on people I pass on the street. Sometimes it's geometric patterns in upholstery or carpeting or wallpaper. Sometimes an image just pops in my head as I'm in that state of half consciousness just before falling asleep (and of course in those instances I have to wake up and jot down some notes so I can remember it the next day). In all cases, I design things that I would want to wear, be they garments or accessories. One technique I can't seem to get away from is stranded colorwork. I love how even with a simple pattern, the knitting looks so much more complex and involved when you add a second color. I think my favorite part of designing is starting with an image in my head and then seeing it come to life in yarn. A pretty close second is when someone else knits one of my patterns and loves the finished project. I'm really inspired by many other designers, especially those who are so generous with their thoughts and experiences on Ravelry. I feel very lucky to be able to interact with designers like Julia Trice, Nina Machlin Dayton, Marnie MacLean, and Ysolda Teague as easily as I'd interact with a coworker or friend. Honestly, any designer who contributes to the discussions in the Ravelry designer groups is my hero because they're all helping those of us who are (relatively speaking) just getting started. As to next year, one of my big goals for myself is to figure out how to use my handspun more often, because frankly it's starting to take over my house! It can be hard to design with handspun because it can be inconsistent and often doesn't fall neatly into the traditional weight categories, so I can see this type of designing resulting in recipe-type projects rather than "normal" patterns. I also want to tackle the long list of patterns that have been on my "to design" list for way too long. I think I may be moving into a cable phase, because some cabled projects are at the top of that list! Sarah, thank you for taking the time and introducing yourself to my blog readers. Good luck with developing your patterns for your handspun yarns! Have a Happy Holiday! Stay tuned because next week we're having a giveaway and meeting Ambah of Ambah|Knitting Design!